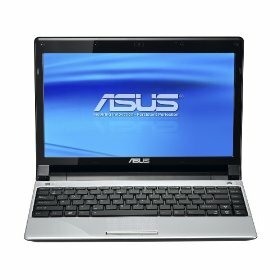 The Asus UL20 hails from Asus’ UnLimited series of netbooks that incorporate the new Intel Core 2 Duo SU7300 processor to allow for optimum multitasking performance while consuming less energy. This series of netbooks are entirely different from the Eee PC netbook line from Asus as they cover the middle ground between full sized notebooks and smaller netbooks. Another difference would be that the UnLimited series is said to be much more powerful than the Eee PC series. It also incorporates the newly designed and exclusive ASUS Turbo33 Technology that is able to tackle process-intensive applications to deliver smoother graphics and online streaming. Besides that, it is also equipped with an aNVIDIA geForce G210M graphics card to deliver stunning visuals in crystal clear clarity. In terms of design, the Asus UL20 sports a slim profile with a chassis that is crafted seemingly out of a single piece satin-brushed aluminum. The Asus UL20 is lightweight but yet maintains a highly robust lid that is able to protect it from day-to-day bumps and abrasions. Besides that, the Asus UL20 also comes with a GraphiX Boost switch that allows you to switch between dedicated and integrated graphics, to suit your usage and preference. Not only that, there is also an intelligent power manage in the form of the ASUS Power4Gear that allows users to choose from 4 profiles to allow them optimum usage according to their prevailing needs. It is available in two colours, including gloss black and silver. The Asus UL20 can run either on an Intel Core 2 Duo Processor SU7300 1.3 GHz, Intel Core 2 Solo Processor SU3500 1.4 Ghz or Intel Celeron Processor SU2300/ 743 1.2 GHz. It operates on a genuine Microsoft Windows Vista and can be upgraded to operate on a genuine Microsoft Windows 7 operating system. Besides that, the Asus UL20 also incorporates a Mobile Intel GS45 Chipset. There is also an LED backlight WXGA Glare-type display that measures 12.1 inches diagonally and has a resolution of 1366 x 768 pixels. In terms of graphics features, the Asus UL20 incorporates an Intel GMA 4500 MHD graphics card. As for system memory, the Asus UL20 can support up to 4 GB of DDR2 SDRAM with a data bus speed of 800 MHz. In terms of storage, the Asus UL20 comes together with an internal hard disk drive of 5400 rpm that has a capacity option of 160 GB, 250 GB or 320 GB. Asus UL20 battery is a 6-cell battery. The Asus UL20 battery life is 6 hours. The Asus UL20 dimensions are 296 mm x 210 mm x 30.9 mm (with 6 cell battery) (W x D x H) in and weighs approximately 1.5 kg including its provided 6 cell battery. The Asus UL20 also has built-in WLAN 802.11 b/g enhanced and Bluetooth 2.1 capabilities. There is also a built-in 0.3 mega pixel web camera situated right above the display. In addition to that, the Asus UL20 also provides powerful sound with built in Altec Lansing speakers, SRS and Intel Audio. The Asus UL20 comes under a two-year international warranty. Acer Aspire One AO532h netbooks feature Atom N450 processor and 10 hour battery life!